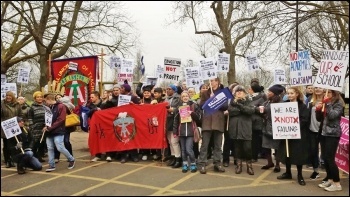 Rizwan Dodya, a mental health service user, contacted Leicester Socialist Party about cuts to local mental health services, writes Andrew Walton, Leicester Socialist Party. No Tory freebie: The Tories' Childcare Bill announced in the Queen's Speech promises to extend free childcare from 15 to 30 hours a week by 2017. What's the catch? Sign the petition! Release Janahan from detention now! The Daily Mail has a habit of blanket scapegoating of the blameless. 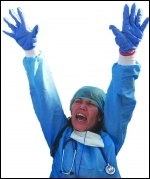 It was recently the turn of Filipino health workers. On 19 May, the Mail screeched: "NHS STILL hiring Filipino nurses" after the trial of Victorino Chua. When attending a rally in Westminster on 30 May to defend the Human Rights Act (HRA), Socialist Party members found ourselves in an unexpected and unprecedented situation. We were on a Liberal Democrat protest! 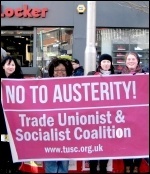 Budget Day: Smash Tory austerity! Strike action gets results - as shown by victories in Lewisham and at Kone engineering - no wonder the Tories want to virtually ban it! Tory Chancellor George Osborne's sale of the remaining 30% government stake in privatised Royal Mail, is a desperate act to meet his commitment of clearing the budget deficit by 2018-19, writes Rob McArdle, postal worker. 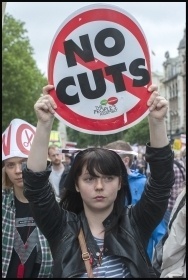 Around 1,000 joined the anti-austerity march and rally in Newcastle on Saturday 6 June, writes Elaine Brunskill. Labour leadership race: Left-wing backbencher and seasoned campaigner Jeremy Corbyn entered the Labour leadership contest on 4 June, writes Sarah Sachs-Eldridge. "Seattle is being turned into a playground for the rich, a profit machine for the big developers... 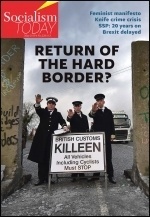 I have a different vision for Seattle, one that is based on social justice, equality, and environmental sustainability"
Political representation for workers was the keynote for the first day and a half of bakers' union BFAWU's annual conference, writes Iain Dalton. It is estimated that 15,000 jobs could be lost as a result of local government reorganisation in Wales. 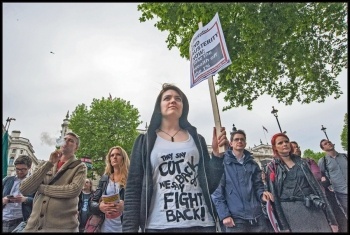 Youth Fight Austerity: protest on 8 July! 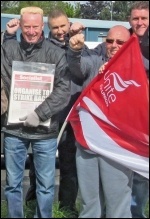 A gardener trade union rep has been victimised by his employers - the same Glasgow venue where his union's annual conference is being held. 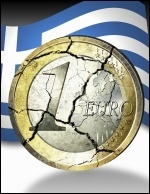 How can we stop austerity? Just six weeks after the general election - on 20 June - people are flocking to London to show opposition to austerity. But after marching - what next? The question in everyone's mind will be how can we stop it? Turkey's political landscape was shaken on 7 June. On election night, the feeling of left and Kurdish activists mirrored that of the Gezi Park movement in the summer of 2013. The ruling right-wing, conservative AKP suffered a huge blow. 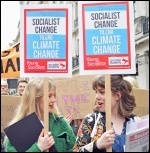 Short reports from socialist activities around the globe. Liverpool city council's historic victory over the Thatcher government has valuable lessons for today. Having cut the taxes of the super-rich and giant corporations, Tory millionaire Chancellor George Osborne is planning to slash £5 billion from Child Tax Credit as part of the governments extra £12 billion cut in welfare spending. Can you make a donation to support the Socialist Party and our struggle for a socialist alternative? John Biggs, long standing Labour right-winger and veteran of the witch-hunt against supporters of the Militant newspaper (forerunner of the Socialist), has been elected mayor of Tower Hamlets with executive powers. This comes after the undemocratic removal of the previously elected mayor by central government. Fight back with the real socialists! 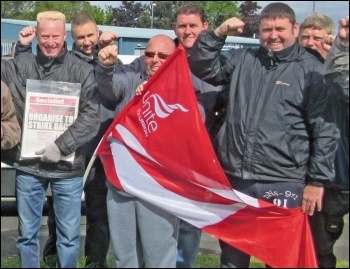 Why I joined the Socialist Party: The main reason I joined the Socialist Party was the support we got on the Kone engineering workers' picket line, writes a shop steward. 30 years ago, the Tories tried to introduce a 'Youth Training Scheme' which conscripted us into working for our dole money. Young people rebelled in their millions and defeated Thatcher's plan. Can Jeremy Corbyn's Labour leadership challenge help to develop the socialist left? 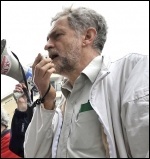 After huge anti-austerity demos: Organise the fightback! As we go to press, members of transport union RMT are discussing how to fight back at their national conference, writes Transport workers plan fightback. Communications regulator Ofcom has announced a "fundamental review" of Royal Mail. This could be the next step in turning the former state postal service, privatised in 2013, into a for-profit business. 150 people, a dalek, a crocodile and Mickey and Minnie Mouse protested on 13 June against cuts to the Library of Birmingham. At the annual Heeley Festival in Sheffield, Socialist Party members held a stall and had a great day - raising £176 for our fighting fund from plant sales. After a long Saturday on the People's Assembly demo, London Socialist Party members met up on Sunday 21 June for a picnic and BBQ in the park - raising £160 for the fighting fund. Writer Patrick Marber returns to the National Theatre after a long absence with a beautiful three-man show set in the desperate, passionate and quasi-religious world of a non-league football club. 5,000 trade unionists, young people and anti-austerity campaigners attended the Scotland United Against Austerity rally con 20 June. The mood reflected a real desire for action against austerity, and a searching for the best way to fight back. The emergence of a new younger generation of activists is a shot in the arm to older workers who are perhaps feeling a little down after the Tory election victory. A new member of the Socialist Party explains that he felt he needed to join the fightback - after years of being faced by a political choice between different shades of blue. 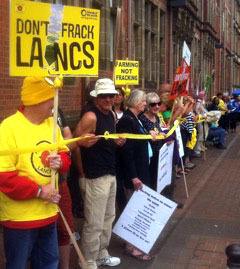 Fracking defeated today in Lancashire!